Fly Away is a fun throw sized quilt that is made using a Layer Cake. 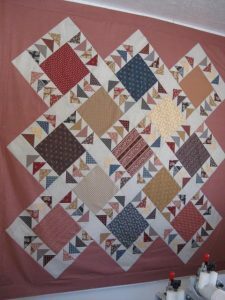 If you like the look of scrappy quilts, using a Layer Cake is the perfect way to accomplish this, and you KNOW it will look great. This quilt includes flying geese and the blocks are placed on point. If you have avoided on point lay outs before, this is the time for you to learn. It is easier than you can imagine when you learn a few tips and tricks. Let’s all Fly Away together!